the familiar Golden Arches sign. 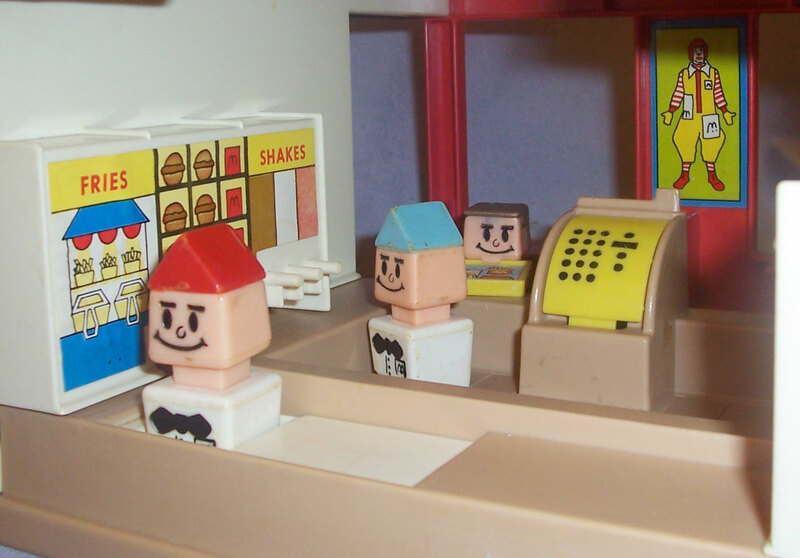 seven play friends (manager, crew, and customers). 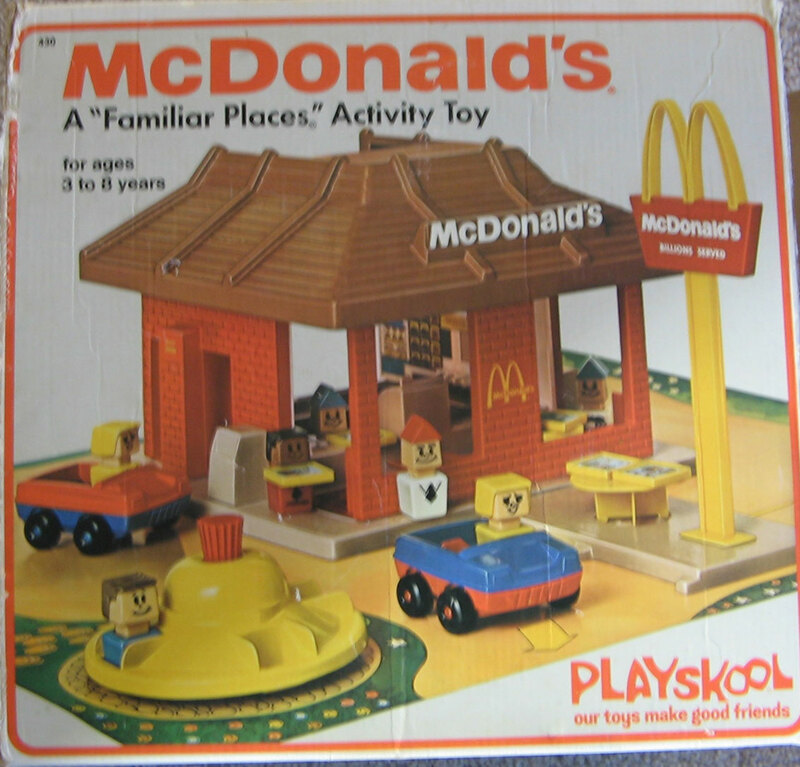 cars to take them to their McDonald's® parking lot. a register that rings when tapped. trays that fit under the play friends chins. a tray return where the trays slide out one-by-one. a merry-go-round for outdoor fun. a patio table for outdoor eating. 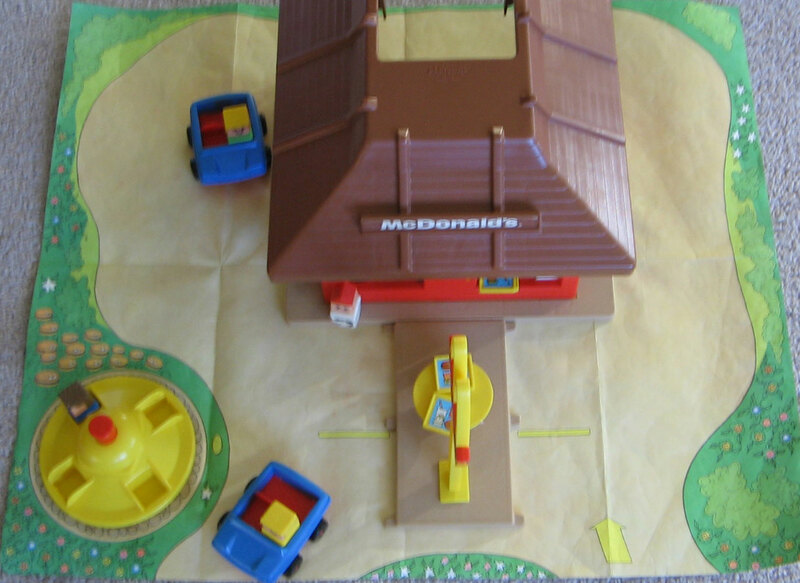 The set includes a playmat with a parking lot, "burger" bushes near the playground area, and an area in the center to place the McDonald's® building. 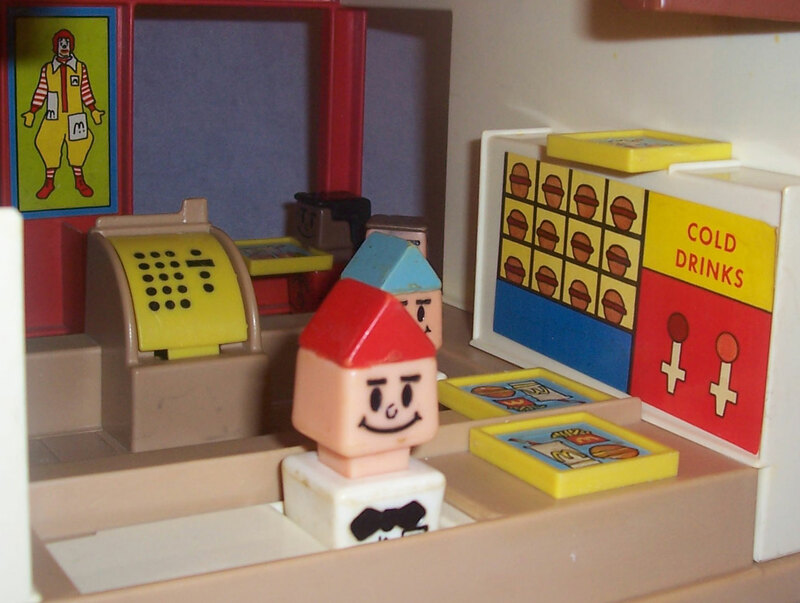 PSKB430 - McDonald's® Restaurant - Square tan base with a square red brick-simulated McDonald's® Restaurant with a brown roof. The front of the restaurant has 2 large open windows with a yellow McDonald's® Golden Arch sign on the wall between the windows. The brown roof (above the windows) has a raised wide rectangular area for a sign (brown litho with McDonald's® in white fits on sign). Both sides of the restaurant has an attached trash can (accessory food trays fit on top of the trash cans). One side has a white recessed area with a divider wall in the middle marked "REST ROOMS" in white. 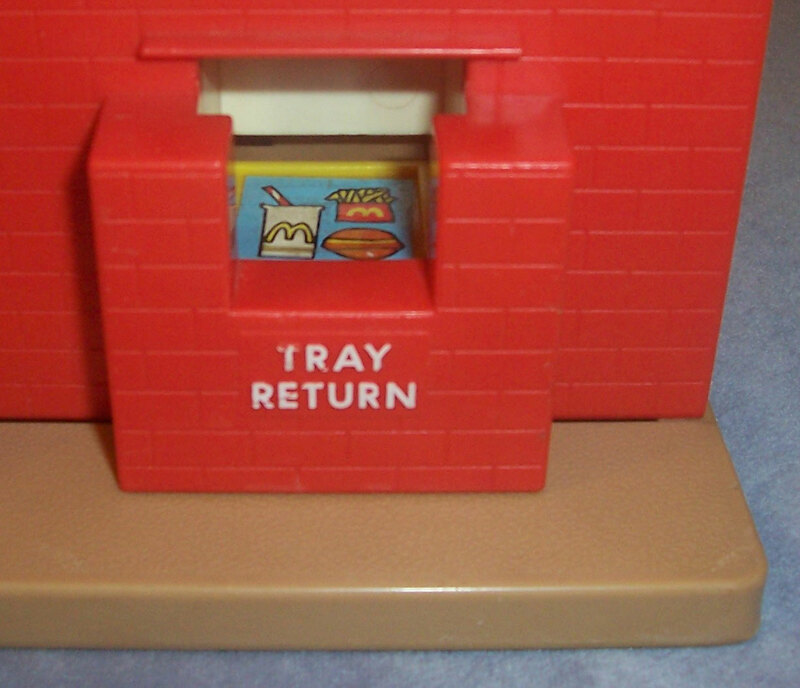 The other side has a square area marked "TRAY RETURN" (accessory food trays fit inside). The back of the restaurant is open to allow play inside. 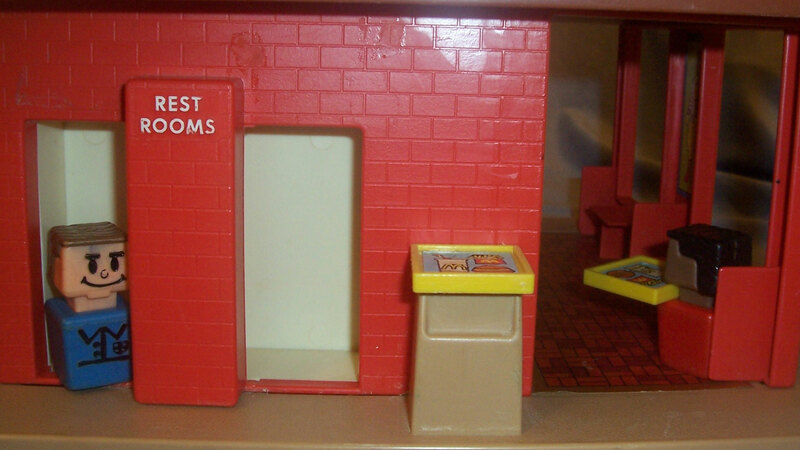 Inside has 2 small built-in tables (1 under each front window), and a work area with a register (rings when tapped), and a white siding work area (sliding from side-to-side moves stacked food trays from the tray return into a line inside the restaurant. 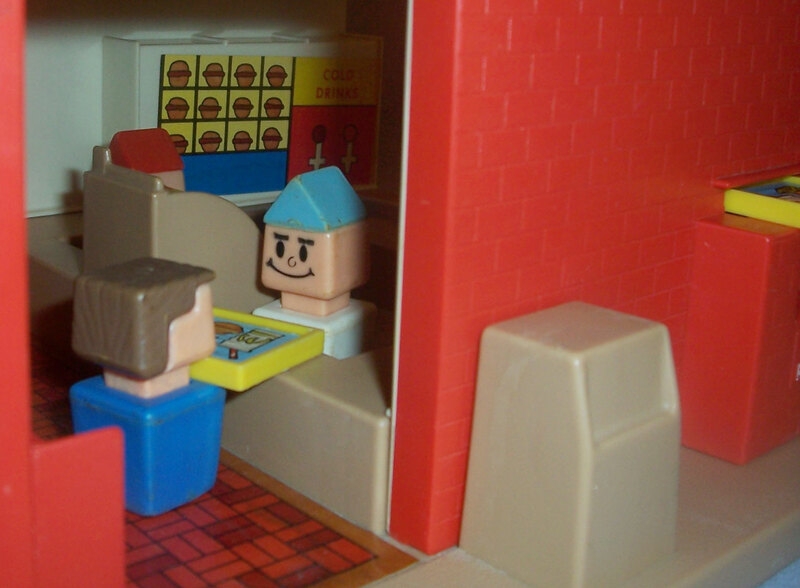 One inside wall features a white fries and shakes machine, the other side features a white burger stacker and cold drinks dispenser (accessory food trays fit on "shelves" above all). Measures 12" x 11" deep x 8-3/4" tall. Top of the roof has a small imprint marked, "Playskool®, No. 430, Chicago, Illinois". 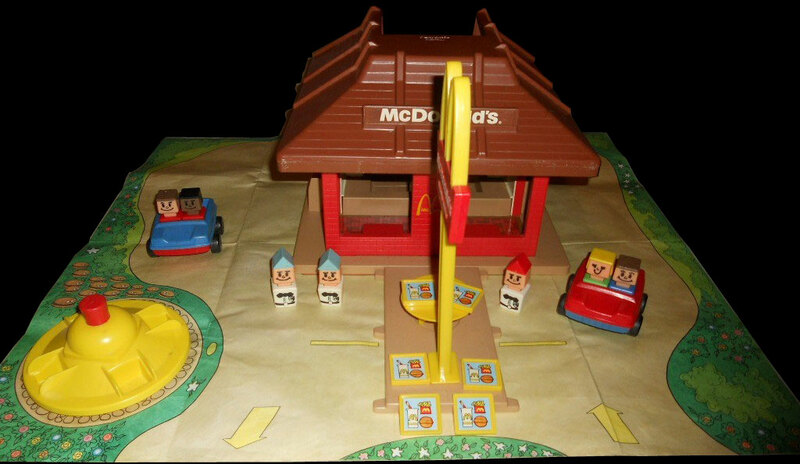 McDonald's® Sign - Brown rectangular litho marked "McDonald's®" in white (litho fits on roof). Ronald McDonald Picture - Green rectangular litho with a brown edge and standing Ronald McDonald in the center (fits on wall between windows inside restaurant). Floor - Large rectangular brown/red bricks (fits on floor in restaurant dining area). Cold Drinks - Yellow rectangular litho with 3 shelf of stacked burgers and a red/yellow area marked "COLD DRINKS" in red. PSK30 - McDonald's® Sign - Red/Yellow sign with yellow golden arches on top, marked "McDonald's, BILLIONS SERVED" in white on both sides of the sign. The sign has a long yellow signpost and a square base. The base has a rectangular tab in the bottom center (fits into slot on the accessory sidewalk). Measures 10-3/8" tall x 4" wide. PSK31 - Sidewalk/Sign Base - Tan rectangular sidewalk piece with a deep recessed rectangular slit (to attach sign) and a recessed circular area (for table) on top. The 2 long sides have 3 curb tabs (6 tabs total) that accessory cars fit between for parking). One short side has a rectangular tab (fits under a small opening under the front of the McDonald's® base). Measures 7-7/8" long x 4-13/16" wide x 1/2" tall. PSK32 - Table - Yellow round table with X-shaped "legs". The table is made of very thin plastic, so the legs are often bent. Table fits within recessed circle on top of the PSK31 Sidewalk/Sign Base. Measures 2-3/4" diameter x 1" tall. PSK33 - Merry-Go-Round - Round yellow 4-square seat merry-go-round with a red spin knob on top. The merry-go-round spins on a small round yellow base. Measures 5-1/2" diameter x 2-1/2" long. PSK34 - Blue top, red base squared car. The red interior is square with a seat backrest divider in the center (can seat 4 figures). Rolls on 4 black wheels marked "Playskool". Wheels have red center rivets. Bottom of car is marked, "PLAYSKOOL, INC., CHICAGO, ILLINOIS, ITEM NO 480, 351902-#. (# = any number 1-9)". Measures 3-3/4" long x 3-1/8" wide x 1-3/4" tall. PSK35 - Red top, blue base squared car. The blue interior is square with a seat backrest divider in the center (can seat 4 figures). Rolls on 4 black wheels marked "Playskool". Wheels have blue center rivets. Bottom of car is marked, "PLAYSKOOL, INC., CHICAGO, ILLINOIS, ITEM NO 480, 351902-#. (# = any number 1-9)". Measures 3-3/4" long x 3-1/8" wide x 1-3/4" tall. 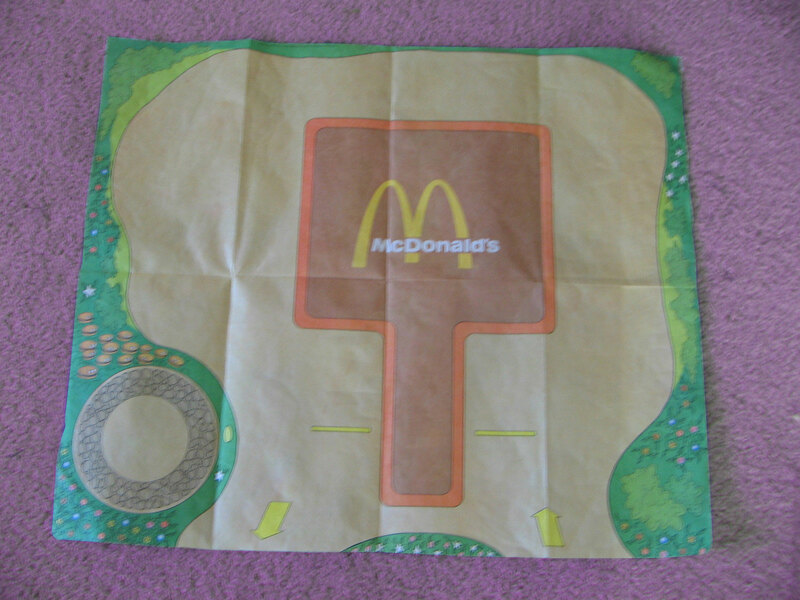 PSK36 - Playmat - Square paper playmat with a parking lot, "burger" bushes near the playground area, and an area in the center to place the McDonald's® building. PSK37 - 6 each - Food Trays - Small square yellow food tray with a blue litho on one side. The litho features a hamburger, a white cup and square red fried, both with a yellow McDonald's "m" and red/white striped straw. 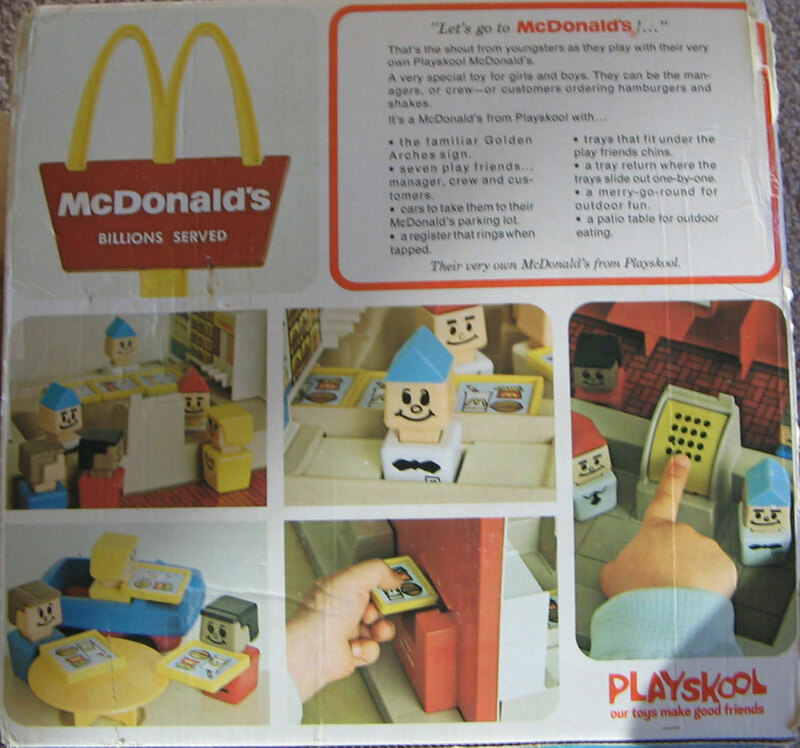 The other side of the food tray is marked "Playskool, No. 430, Chicago, Illinois, 351859". PSK18 - McDonald's® Manager - White base, RED hat, chest design: Bowtie, 3 buttons, McDonald's® logo on pocket, belt w/ buckle. 2 each - PSK17 - McDonald's® Employees - White base, BLUE hat, chest design: Bowtie, 3 buttons, McDonald's® logo on pocket, belt w/ buckle. PSK3 - Blue base, brown hair, chest design: V-Collar, 2 buttons, Emblem. PSK6 - Green base, yellow hair, chest design: Curved collar, Pearl necklace. PSK9 - Red base, brown hair, chest design: Triangle Collar, Polka-dot Tie. PSK19 - Yellow base, yellow hair, chest design: Curved collar, Pearl necklace. PSK325 - (BOX ONLY) - Sold in a 13" wide x 12" tall x 9" deep box. PSK326 - Complete set in original 13" wide x 12" tall x 9" deep box. Featured in 1975 Sears Christmas Wishbook (page 488) - price $10.87. Featured in 1975 Wards Christmas Wishbook (page 313) - price $10.44. Featured in 1976 JcPenny Christmas Wish Book (page 362) - price $11.88. 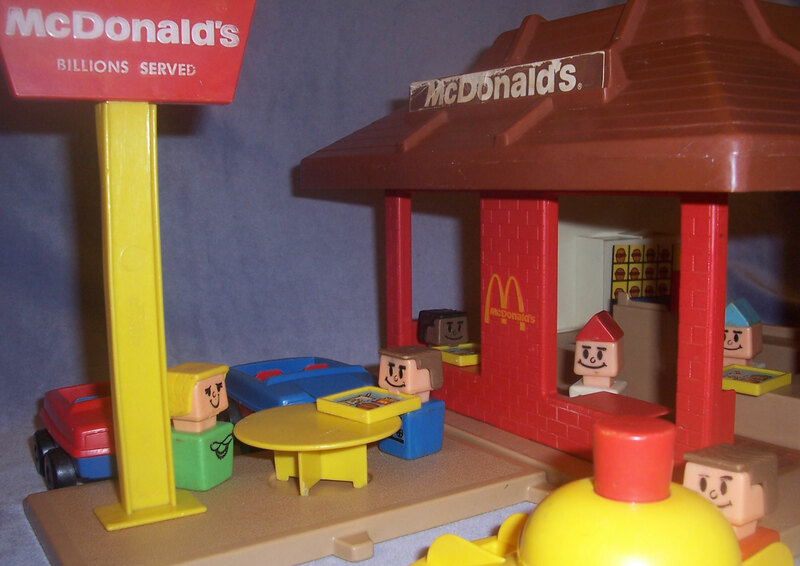 Also see Fisher-Price Original Little People Playset: #2552 Little People McDonald's® Restaurant (1990-1990).